These days, it’s not uncommon for shooters to bring electrical gadgets to the shooting range, particularly when testing loads. You’ll see guys running chronos with laptop computers, or loading with electronic powder dispensers (such as the RCBS ChargeMaster). If your favorite range doesn’t have AC outlets, how do you keep all that stuff powered up? You can get one of those portable 120v power supplies (basically a big battery with inverter and carry handle), but they are heavy and fairly expensive. Another option, for those needing 120v AC to drive powder dispensers, laptops etc., is to use your car battery. Compact, affordable, and reliable inverters are now available that let you draw current from your car/truck’s cigarette lighter or accessory jack. Yes, it would be possible to run-down your battery, but if you start with a healthy vehicle battery, you’re not going to drain it by throwing a couple dozen charges with a ChargeMaster. 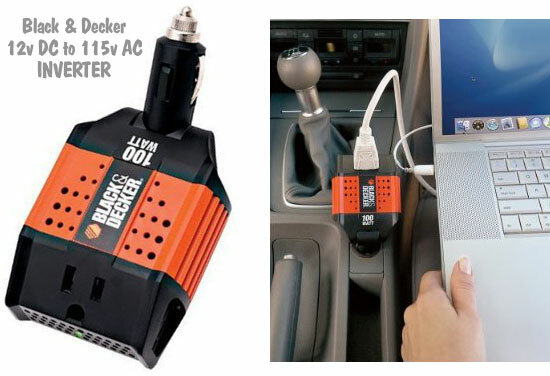 Black & Decker makes a rugged 100-Watt Inverter that converts your vehicle’s 12-volt DC power into 115-volt AC power. The unit has a single AC outlet, with an accessory plug that adjusts 45 degrees for convenience. An automatic low battery shutdown prevents draining the vehicle battery, and an LED indicator shows charging status. Black & Decker backs its inverter with a 2-year warranty. The Black & Decker 100-Watt Inverter costs $22.96 at Amazon.com. Duracell has a similar Pocket Power Inverter fitted with a cord on the 12V end. (The cord is much longer than shown in picture). The cord can be helpful if your power take-off or cigarette lighter jack is hard to access. The Duracell unit has been popular, but, unlike the Black & Decker, the Duracell only delivers 100 Watts for for 5 minutes, after that it delivers 80 watts. That’s still enough to drive most of the gadgets you’ll use for load testing at the range. 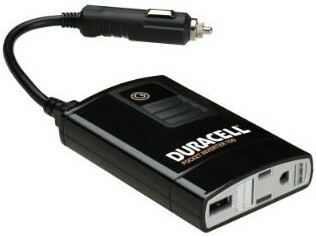 Duracells Pocket Power Inverter sells for $19.99 on Amazon.com. A more powerful 175 watt version sells for $48.75. Share the post "Affordable Inverters Provide Power at the Range"
Right now Cabela’s.com is running a major Hunting Gear SALE with some popular items discounted 30% or more. You’ll find great deals on Bushnell, Leupold, and Nikon optics. Rifle ammo for a wide variety of calibers is on sale, and you’ll find good deals on knives and hunting accessories. To make this sale even more attractive, Cabela’s is offering $5 flat-rate shipping, now through February 16, 2010. To qualify, your order must total AT LEAST $150.00, and you need to use Promo Code 2XFLAT when checking out. Share the post "Hunting Gear Sale at Cabela's Plus Flat-Rate Shipping"